A rich and extravagant drinking chocolate. 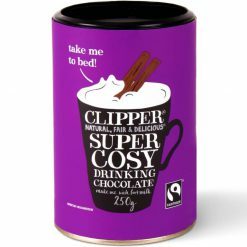 Luxurious, rich and smooth, Clipper Fairtrade Drinking Chocolate is truly delectable. Not only that, it has got a conscience too, being Fairtrade. Make with hot water and add milk to taste, or with hot milk, and delight in the rich and extravagant taste, ideal for a spot of evening indulgence.